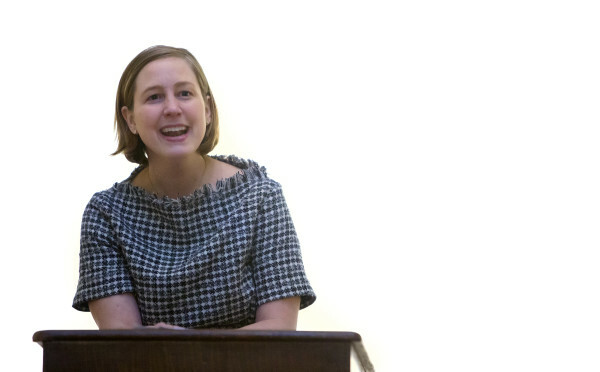 Kathleen Kingsbury, deputy managing editor of The Boston Globe and 2015 Pulitzer Prize winner for Editorial Writing, gives an overview of her writing during a talk on Tuesday at the Bangor Public Library in Bangor. Kingsbury was awarded the Pulitzer Prize in 2015 for taking readers on a tour of restaurant workers' bank accounts to expose the real price of inexpensive menu items and the human costs of income inequality. 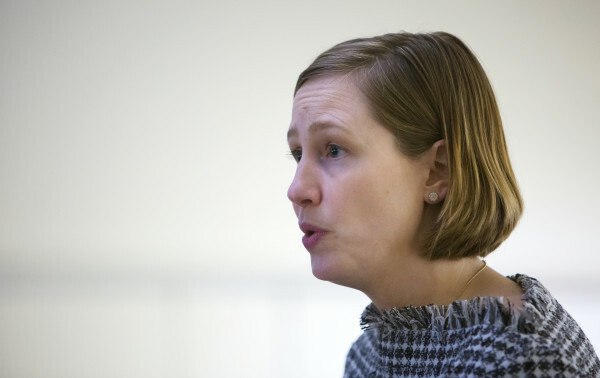 Kathleen Kingsbury (right), deputy managing editor of The Boston Globe and 2015 Pulitzer Prize winner for Editorial Writing, addresses the crowd during a talk on Tuesday at the Bangor Public Library in Bangor. Kingsbury was awarded the Pulitzer Prize in 2015 for taking readers on a tour of restaurant workers' bank accounts to expose the real price of inexpensive menu items and the human costs of income inequality. 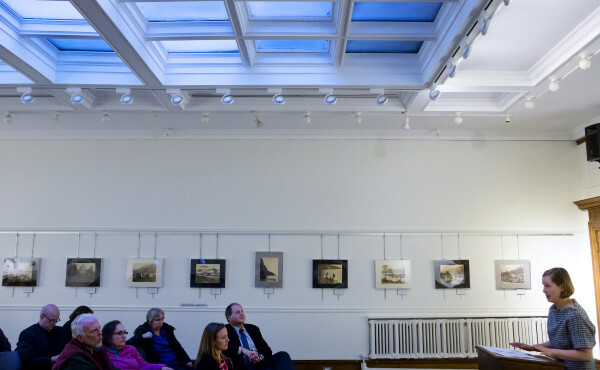 Kathleen Kingsbury, deputy managing editor of The Boston Globe and 2015 Pulitzer Prize winner for Editorial Writing, answers questions during a talk on Tuesday at the Bangor Public Library in Bangor. Kingsbury was awarded the Pulitzer Prize in 2015 for taking readers on a tour of restaurant workers' bank accounts to expose the real price of inexpensive menu items and the human costs of income inequality. 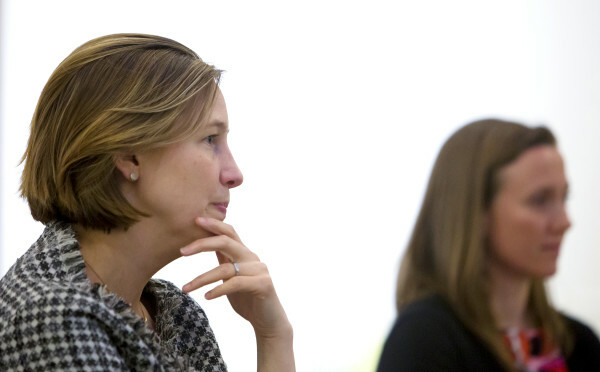 Kathleen Kingsbury, deputy managing editor of The Boston Globe and 2015 Pulitzer Prize winner for Editorial Writing, listens to questions during a talk on Tuesday at the Bangor Public Library in Bangor. Kingsbury was awarded the Pulitzer Prize in 2015 for taking readers on a tour of restaurant workers' bank accounts to expose the real price of inexpensive menu items and the human costs of income inequality. BANGOR, Maine — As Pulitzer Prize winner Kathleen Kingsbury sees it, patrons of the nation’s restaurants can play a role in helping those who serve and cook their meals earn a living wage. A national conversation is beginning to get underway with regard to income equality for those working in the nation’s restaurant and retail industries, in which workers earn relatively low wages, often too low to support themselves and their families, Kingsbury, deputy managing editor for the Boston Globe, said during a talk Tuesday evening at the Bangor Public Library as part of Pulitzer Week. Kingsbury’s talk was particularly relevant to people in Bangor, where city councilors voted 7-2 in December 2015 to increase the minimum wage starting in 2017, and the state of Maine, where a referendum question that would raise Maine’s minimum wage to $12 per hour by 2020 qualified for the November ballot. Her hard-hitting series of editorials, “Service Not Included,” appeared in the Boston Globe. The series put a human face on the financial struggles of restaurant workers, many of whom do not earn a living wage. “Despite a recovery in the economy, wages are still too low for too many workers. Too many families are struggling to survive, to put food on the table and make sure their family’s future is brighter than their own,” said Kingsbury, who was awarded the 2015 Pulitzer Prize for Editorial Writing for exposing the real price of inexpensive menu items and the human costs of income inequality. “For far too many people, the social contract is broken, and we see that played out in the restaurant industry almost every day. If we saw a national $15 minimum wage, it would give a raise to nearly half of American workers today, many of them working in the restaurant and retail businesses,” she said. Getting there would be difficult, given the strong lobby that the National Restaurant Association and similar organizations have. But there are signs that the lot of restaurant workers could improve in the near future, she said. For the first time, the National Labor Relations Board is allowing collective bargaining for fast food workers, she said. In addition, some states, including California and New York, are exploring a $15 minimum wage for restaurant workers. “Most Americans eat out on an average of seven times a week, and having good restaurants nearby has become an increasing part of what makes a community feel livable,” she said. “Once we as a collective voice start to speak up, restaurant owners and lawmakers will respond in kind. Until then, please tip generously,” she said. “Restaurants who treat their workers well are repaid for it,” she said, citing the success chains such as In-N-Out Burger and Shake Shack have enjoyed. “They see their business thrive, and there’s been very little blowback. They get to keep their workers, their workers stay and that 95 percent turnover rate [annually at the national level] goes away and becomes dramatically lower,” she said. Pulitzer Week was funded by a grant from the Maine Humanities Council as part of the Pulitzer Prize Centennial Campﬁres Initiative, with additional funding provided by the University of Maine Humanities Center and the University of Maine Department of Communication and Journalism’s Alan Miller Fund for Excellence in Communication and Journalism. Community partners include Bangor Public Library and the Bangor Daily News.